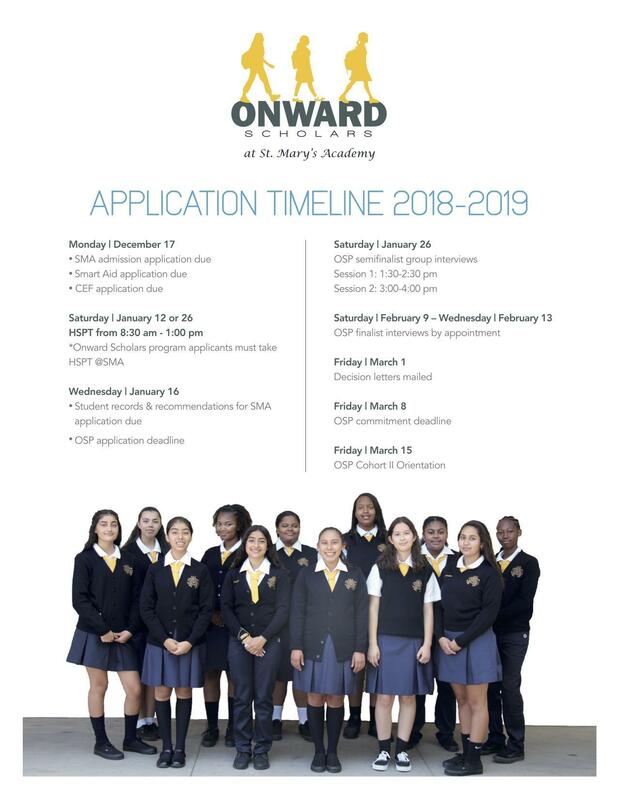 The Onward Scholars program (OSP) at St. Mary’s Academy is open to well-rounded girls who have demonstrated academic and leadership potential, are motivated students, and plan to attend a four-year college. The OSP Scholarship will be awarded to 12 incoming freshmen every academic year effective Fall 2018. 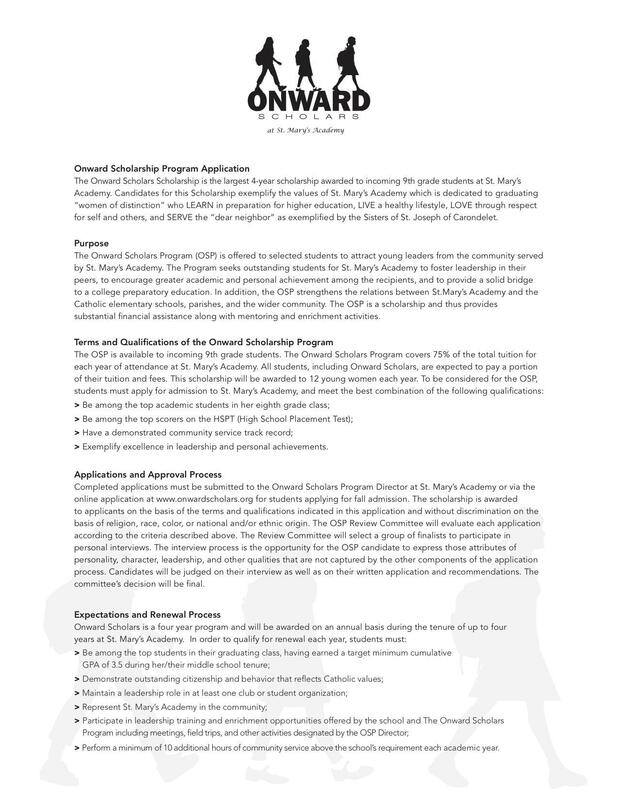 Candidates for the OSP Scholarship must complete an OSP application, take the High School Placement Test (HSPT) at SMA, and be admitted to the 9th grade at St. Mary’s Academy. Approximately 50 students will be selected from the applicant pool to participate in the group interviews conducted by the OSP Review Committee, which includes the OSP Director and other designees of the St. Mary’s community. The interview process is the opportunity for the OSP candidate to express those attributes of personality, character, leadership, and personal qualities that are not captured by the other components of the application process. Interviewees will be evaluated based on both their verbal and physical presentation and ability to convey their interests, personality, and enthusiasm. 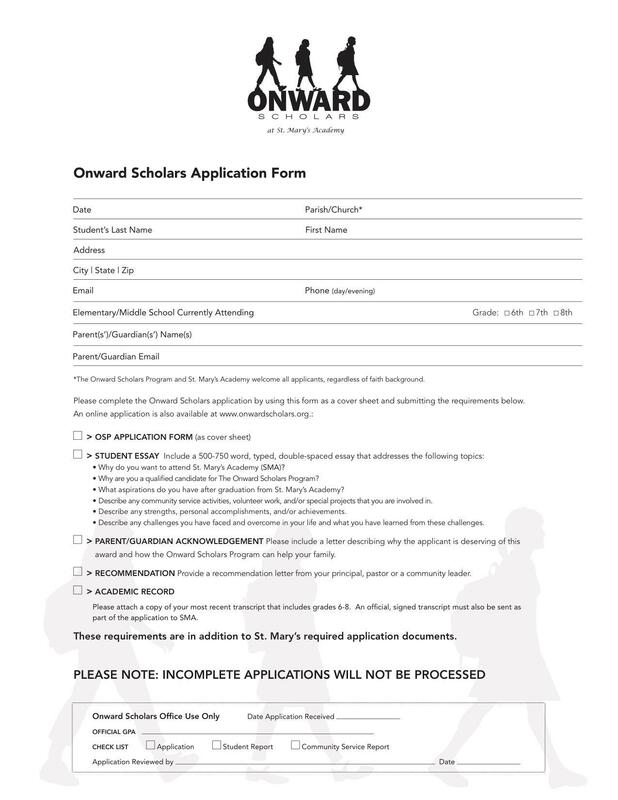 A group of approximately 20 students will then be selected for the individual interviews with the Onward Scholars Program Director and SMA Principal. A final 12 students and up to 6 students for a wait list will be selected from the process described above. Finalists will be notified through mail in early March, in alignment with the SMA admissions timeline. The committee’s and Program Director’s decisions are final.